It’s time for season 21 of Man Of The Hour to come to an end. But please, try to control your tears and view this episode for what it really is: An early Christmas present. The guys are back for one more time in 2016, and it might be their best episode yet. What’s the story, morning glory? Pat & Seb recount everything that happened 21 years ago from Dave Grohl to Oasis. Then, they give us excuses to put up our Christmas trees too early, and wish us all a happy holiday while leaving us a great resolution suggestion (just don’t behead people, man). Now, all we can do is hope for an early renewal (unlike Pat, who got hit with renewal charges back in October). Brought to you by, Sonos. The smart speaker system that streams all your favorite music to any room, or every room. Also, Berklee Online. Now giving you the option to complete your degree online. Learn more at http://online.berklee.edu/moth. Another week has gone by, and that means another episode of Man Of The Hour is ready for your ears. This week, the guys share everything they’re thinking about in the beautiful life they’re livin’. From Prince Harry to Niall Horan, catch up on their pop culture dish of the week. Then, listen as they answer life’s most important questions like: “Are iPods for babies?” “Why do they not shoot?”, and “Do you believe in ghosts?”. It’s all here, with Pat and Seb! Brought to you by, Berklee Online. Now giving you the option to complete your degree online. Learn more at http://online.berklee.edu/moth. On the latest episode, Pat and non-sick Seb provide plenty of interesting conversation starters for your family gatherings this holiday, like Uber in India and why Jay Z is amazing. They’ll also chat about Shah Rukh Khan (repeatedly) and #bringbackthePat. Hear it all here, on Man Of The Hour! Brought to you by, Sonos. You provide the friends and the home and SONOS provides the chef and the home sound system. Enter for a chance to win, and learn everything you need to know at PlaylistPotluck.Sonos.com. Grab your best headphones, and settle in, because it’s time for another episode of Man Of The Hour. This week, the show is happening thanks to internet magic and India—which means you should be thankful too, because you’re about to hear stories of buying houses with iPhones, and the highest paid women in music. The guys also cover million dollar ideas like incorrect World Series tattoos (whoever said tattoos are permanent didn’t tell this guy), and mom gifts. Hear it all here, on Man Of The Hour! This episode is brought to you by, Hello Fresh. For $35 off your first week of deliveries, visit hellofresh.com and enter MAN when you subscribe! Also, brought to you by, Berklee Online. Learn more at online.berklee.edu/moth. Welcome back to Man Of The Hour, where the conversations only get weirder and the music only gets better. This week, the guys discuss topics such as Instagram followers, Nintendo, and rhythm guitarists. We also find out whether Seb’s estate will become an aquarium, skate park, or Mickey Mouse house in the event of his death and his wife’s remarriage. Hear it all here on Man Of The Hour! Today’s episode is brought to you by, Sonos. The smart speaker system that streams all your favorite music to any room, or every room. Control your music with one simple app, and fill your home with pure, immersive sound. Another new episode of Man Of The Hour is waiting for you to hit the play button. This week, the guys celebrate Nelly’s birthday and frequent flier status upgrades—it’s an exciting time, that leads to plenty of conversation topics and informational tips! Not only will you learn about an instrument library, but you’ll also pick up stellar sports terms, so next time you catch a game you can yell out knowledgeable lines like, “That was a nice basketball!” and tell your friends how you picked your favorite team based on your favorite color. It’s all here on Man Of The Hour, don’t miss it! With Halloween just around the corner, and the holidays quickly approaching, the most pressing thing on the Man Of The Hour agenda is… who Katy Perry’s seeing. Okay, okay, there’s a few other things up there too, like getting rich off swearing (a solid plan, if we do say so), Detroit things (is it a tradition or are the wings just that good?) and skin colored underwear (because Blink 182 will be Blink 182). The third episode of Man of the Hour’s 21st season is a lucky one, thanks to Seb’s four leaf clover (that basically only works for guitar picks). If you’re tuning in this week, you’ll hear conversations about Limp Bizkit and Lady Gaga and renting your local movie theater. As if that wasn’t enough, the guys also chat about Brangelina and Tinder, after Chuck’s annoying voicemail makes a guest appearance. It’s all here on idobi Radio, don’t miss it! This episode brought to you by, Thursday Boot Company. Head over to thursdayboots.com/moth to see a selection of Seb and Pat’s favorites! And Boom 2, a volume enhancement app by Global Delight. Don’t keep your ears waiting and logon to BoomForMac.com NOW! There should only be one thing on your agenda this Thursday, and that’s listening to the latest Man Of The Hour podcast. This week, Seb & Pat take on Smallpools and big pools, satisfying careers, and everyone’s celeb crushes David Beckham and Justin Timberlake. The guys also chat about the hip prime minister and whether or not Canada is America’s backyard. Hit play above! Thanks to supply and demand, your week just got an injection of Pat & Seb. 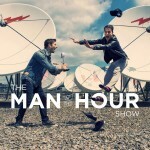 The guys are back for the twenty-first season of Man Of The Hour, and now that the show is legal, they have a lot to talk about. Tune in to find out the guys’ opinion on Instagram stories, and learn about Pat and the Backstreet Boys, while Seb makes everyone feel bad and delivers a mystery box for Pat’s son Benjamin. The only question left is, how bad will next episode’s hangover be?